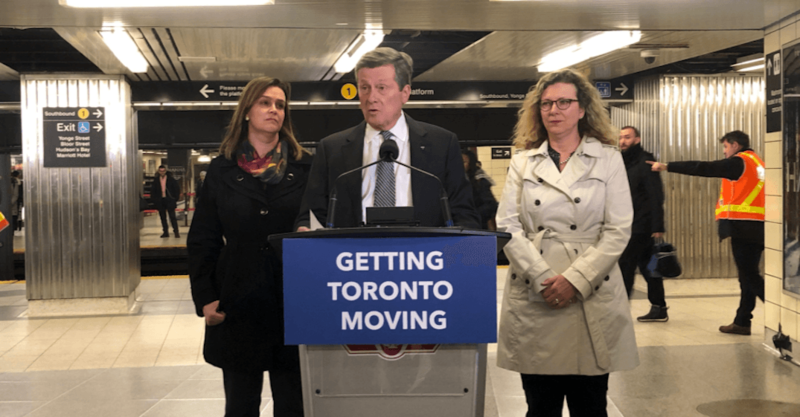 Mayor John Tory says he has a ‘long list of questions’ regarding Premier Ford’s $28.5 billion provincial transit plan. At a press conference Wednesday afternoon, Tory responded to the premier’s proposed plan, telling members of the media he didn’t know the details prior to this morning’s announcement. Tory acknowledged why he didn’t attend Wednesday’s press conference, saying he doesn’t attend an announcement without knowing all the facts, despite speaking with Ford on Tuesday evening. He added that he needs more details on the provincial plan but welcomes the discussion with Ford. Tory also said he still has questions for Ford, including how the provincial government’s technology will speed up the Relief Line. In Ford’s plan, the Relief Line is changed, and called the ‘Ontario Line,’ which will link Ontario Place to the Ontario Science Centre by 2027. The plan is budgeted to cost $10.9 billion. Ontario Place is also conveniently where a proposed potential casino would be located. Tory did say he agreed with the need for transit to Ontario Place, however, he added that he still doesn’t agree with building a casino in the area. Earlier on Wednesday, transit advocates said that Ontario’s new transit plans will delay lines and leave Eastern Scarborough without rapid transit.